Companies and Homeowners rely on their computers for multiple purposes, whether Computer service entertainment or work assignment. So, when your computer malfunctions, it’s easy to fret over the cost of troubleshooting and how you’ll manage to complete your work assignment without a functional computer. Computerlink offer a responsive home and Office computer service call out for the aforementioned situations. We’ll be out to you at the earliest to attend your IT-related exigency. Sometimes, computer components are irreparable, or their repair outlays are too high to justify. If this is the case, we can install a brand new component in place of the existing one. The new component will deliver better performance, offer higher value and reliability whilst keeping your computer up and running for years to come. You’d be glad to know that we use only high-quality, authentic replacement parts. We believe that it’s worth paying a little extra for quality, because while cheaper substitutes may provide a temporary fix, they’re quite likely to fail and eventually let you down. 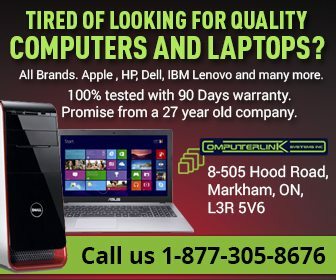 If you want to put computer-related apprehensions to the back of your mind, our experienced IT professionals can provide monthly computer maintenance Markham-wide assistance and home computer installation services. We’ll examine your system and will address every software, hardware or network related issues, followed by the safest, cost-effective repair solutions. We provide out-and-out IT and networking services throughout the Markham, Toronto area. Give us a call to avail of professional yet affordable technical aid at your convenience.